The World War I memorial is a pyramid-shaped stone monument with a flat top, where some believe an additional portion of the monument once stood. The inscription is located on the side of the monument facing away from the Courthouse, etched into a darker stone in contrast with the rest of the monument. The memorial looks somewhat dilapidated and unkempt in comparison with the newer Confederate monument behind it. According to research by local historian Ken Brown, 91 people from Stokes County have been killed in action since World War I. The monument is in front of and in line with a Confederate Memorial, both in front of the Stokes County Courthouse. The World War I monument has not been as well kept as the Confederate monument and is noticeably more weathered. 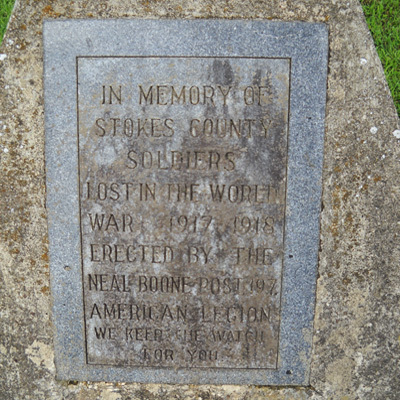 The monument is located on a lawn in front of the Stokes County Courthouse.